Today was an off schedule run but I was feeling like a caged greyhound after 4 strait days of torrential rain and being stuck indoors with toddlers. My mood has not been pretty to say the least. I begged my mom to come over today to give me a break and off I went in my new Heathered Menthol CRB for a 4.25 mile run. For those of you still wondering what the Heathered Menthol CRB feels like, it’s exactly the same as the Heathered Rose Quartz CRB that was out last week and has the same fabric composition. I find it quite soft, not the softest ever but it is soft. The color is really pretty but I think they should have considered naming it something more nostalgic like ‘Miami Vice Green’..although I guess Menthol Cigarettes are also nostalgic for some. 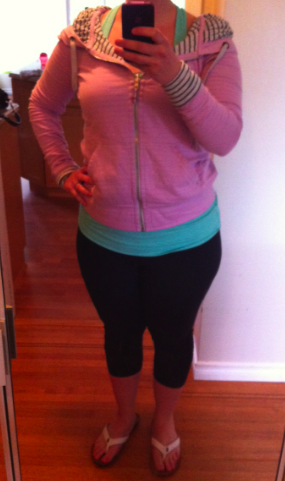 I went with the Miami Vice look and paired it with a soft pastel pink, my Iris Aura Hoodie for after my run. This color pairs so nicely with a lot of different things. Also, I got a new pair of flip-flops yesterday. I’ve been needing a new pair of spring/summer shoes to wear with my crops and shorts and couldn’t decide between a pair of Toms shoes, Sanuk flip flops, Reefs, Uggs Fuzzy Flip Flops, Birkenstocks or something else. 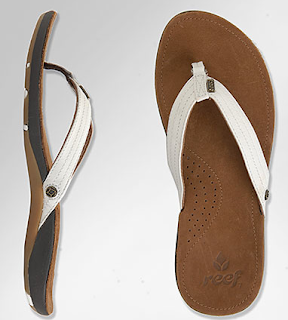 I tried on shoes for the past 3 weeks and finally yesterday I bit the bullet with these Reef Miss J-Bay. They were on the pricier end for flip flops but what sold them for me was that they are all leather, have contoured foot bed and are really comfortable. The Sanuk Yoga Mat Flip-Flops were nice too but I felt like once my foot got clammy they would slide around and not grip since it’s a synthetic material. I’ve worn these all day yesterday and today and I think they are really worth it. 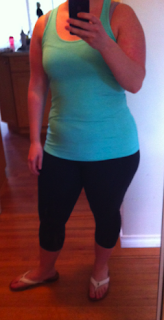 They are so comfortable and with running in minimal shoes for the past few weeks I felt like I really needed to avoid too flat flip flops and really baby my feet. "Sneak Peek From Down Unda: Porcelaine Beachy Floral Define Jacket"